To satisfy the masses, I have offered a variety of colours and designs both with and without backprints. Read and choose carefully - those with backprints are more expensive. Note that N.A. prices are in Canadian dollars and European prices are in pounds. I have tried the American Apparel shirts and can attest that they are of high quality, soft, thin, and well fitted (and ethically produced). They also fit relatively small, so read the sizes and consider ordering a size larger than normal. Of course, all proceeds from these shirts will go towards funding hosting for the forum. How can I set it up for other things? I'd love a hoody. It get's cold over here. If there's enough demand I could set it up with some other options. Short-sleeved t-shirts just seemed like the most universal way to start things off. I'll order one this afternoon. They're looking awesome! have you addvertised them elsewhere? say like other diabolo sites, maybe. Glad people like them. So far 7 have been sold... mostly in North America. I'm curious - what do you mean by that? 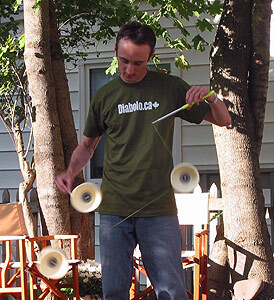 I ordered 2, one was the diabolo.ca one and the other had one of my pictures on the back, click here for the design. If a hoodie comes out, that'll be super and I may pump for one of those. Though I might just get a double sided t-shirt if that's all that will be produced. Well done for getting it done Sean, most appreciated. LOL, but please design nothing concerning the axle - remember the devilsticker in the Bordeaux vid! I'll look into setting up some hoodies.